Because variable ‘in’ is type ‘char’, characters above 0x80 lead to negative indices. This vulnerability may lead out-of-boud read and theoretically cause Segmentation Fault (Denial of Service attack). Unfortunately I couldn’t find any binaries where .rodata section before the base64_reverse_table table cause this situation. First column is the offset so vulnerability is executed like it should be (negative offsets). Second column is byte which is read out-of-bound. How to run this very primitive Proof of Concept? Maybe you can find vulnerable binary? Anyway, I am impressed how many people saw this post and how fast this link was shared in community 🙂 Of course I’m happy of that but also a bit terrified. Anyway, in this short post I didn’t put much details about how to implement this VM, if there is any difficulties, etc. This was one of the reason I received a few emails asking some help to solve it. This is the reason why I decide finally write this second post. I want to share with my VM which i wrote in pure C (I love this language). To be honest I didn’t implement it at the beginning like it is here. I found some implementation in the http://pastebin.com webpage in python language. Unfortunately it has some mistakes (in fact serious mistakes). This was the reason why this machine didn’t work properly and in fact after a few instruction put exceptions and of course whole VM stops. I spend some time to fix it and I did it. After rewriting this machine, python VM starts working. This machine had a few problems like doesn’t correct implement the most important instructions (JMP and JMPE). Also there was mistakes in take care about MOD flag. Another bug was that CS and DS register can be used in operations like ADD via normal operand argument as register. Also operations which use addressing [seg:off] must especially take care if the arguments are inside of the SEGMENT, if not make them fix. In fact this was critical bugs. Btw. In fact this challenge is NOT finished yet… Maybe it was mistake to publish solution BEFORE end of it? I feel a bit guilty. Yesterday I read in one of the polish portal (with news) an information about interesting challenge organized by the Government Communications Headquarters (GCHQ). This is a British intelligence agency responsible for providing signals intelligence (SIGINT) and information assurance to the UK government and armed forces. 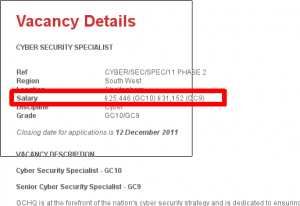 Based in Cheltenham, it operates under the guidance of the Joint Intelligence Committee. 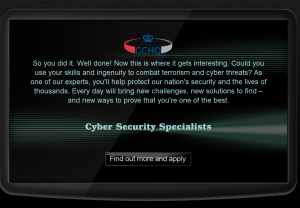 CESG (originally Communications-Electronics Security Group) is the branch of GCHQ which works to secure the communications and information systems of the government and critical parts of UK national infrastructure. 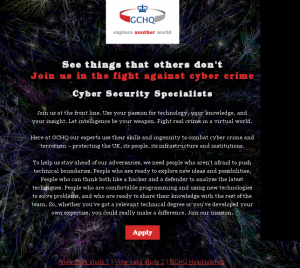 GCHQ, is aiming to attract the next generation of web-savvy spies by running an ad campaign that challenges computer hackers to crack a code to get an interview. Perfect. Now we have another problem – which data should be added in the end of shellcode? We can manually add 0x42424242 value to pass the compare check but what about further code? Maybe this 0x42424242 is a tip? In further code the value for %%edx register is also popped from the stack. And next bytes are used to copy in temporary place and manipulate them. So of course all of this is a tip. 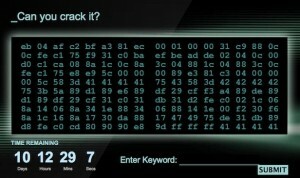 Lets come back again to the main page of the crack site. Bytes which we used to create shellcode are not in the site as text but as image. We were frustrating to rewrite them manually not just simply copying. But wait a minute why this is an image? Interesting, isn’t it? 🙂 Yep the first level is done. What does this link have? We know how instruction encoding looks like. We know how to manipulate flags register. To solve this level we must know that segment-offset architecture has always shifted memory etc. If we look closer we can find that emulated %%ds register has value 0x10 (because its 16 bits architecture). Btw. to be sure that our emulator is correct, last instruction must be ‘hlt’ – halt. mov    [esp+78h+var_74], offset aR ; "r"
mov    [esp+78h+var_78], offset aLicense_txt ;    "license.txt"
mov    [esp+78h+var_78], offset aErrorLicense_t ; "error: license.txt not found\n"
mov    [esp+78h+var_74], offset aS ; "%s"
Two ways can be used to find this string – bruteforce and rainbow tables. I’ve done both 😀 In fact bruteforcing won’t take as much time. Anyway the answer is…. So first value as I pointed in all previous sentence (when I described first level also I point it specially) is from the unused code from the shellcode. Two next bytes are the firmware from the second stage.